These simple treats deliver seasonal flavors without the toil of pastry making. Just in from the Department of Shameless Promotion: My friend and former Cook’s Illustrated colleague Raquel Pelzel, who has written numerous cookbooks in collaboration with various food-world luminaries, has just released her first solo effort, Toast: The Cookbook. (Full disclosure: I tested a few recipes for her book, published by Phaidon Press Ltd.) Toasting bread ain’t rocket science, so what Raq’s really offering here is a lovely assortment of toppings aimed at turning crispy bread into an appetizer, snack, meal, or, as in the case of the recipes adapted here, dessert. These recipes use classic fall flavors often found in pies and tarts — Dutch apple, roasted pear, and apple-cranberry. They’re just as delicious and satisfying as pie, but faster and easier to make. If you’d like to serve these warm, pop the toasts into a 450-degree oven for about 4 minutes (watch the bread edges, which can burn easily), add the yogurt mixture and almonds, and serve at once. 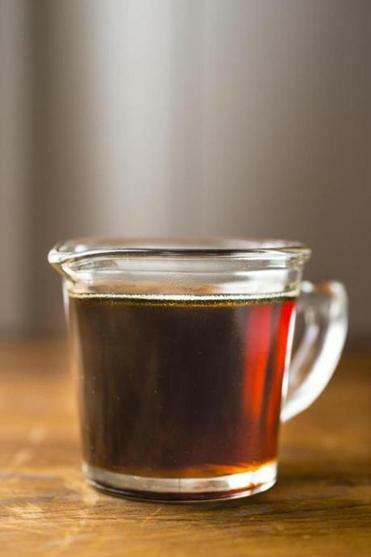 Tip: The US Department of Agriculture eliminated the Grade B maple syrup designation this year; Canada will follow suit. US Grade A now includes four classes of syrups: golden color with delicate taste, amber with rich taste, dark with robust taste, and very dark with strong taste. With the rack in the center position, heat the oven to 425 degrees. Line a rimmed baking sheet with parchment and set aside. In a medium bowl, whisk the maple syrup, brown sugar, and ¼ teaspoon salt until uniform (break up any sugar lumps). Add the pears and fold gently to coat (try to avoid breaking slices); set aside to macerate for 5 minutes. Arrange the pear slices in a single layer on the prepared baking sheet with a little space between them. About 2½ tablespoons syrupy juices should remain in the bowl. Drizzle pear slices with about 1 tablespoon of the leftover juices; reserve the remaining 1½ tablespoons. Roast the pears until they appear dry and lightly browned around the bottom edges and are tender, about 13 minutes. Remove the baking sheet from the oven and, using a thin spatula, carefully turn over the pear slices, drizzle them with the lemon juice, and set aside to cool briefly. Meanwhile, add the yogurt, vanilla, and a pinch of salt to the bowl with the remaining juices and whisk until uniform. 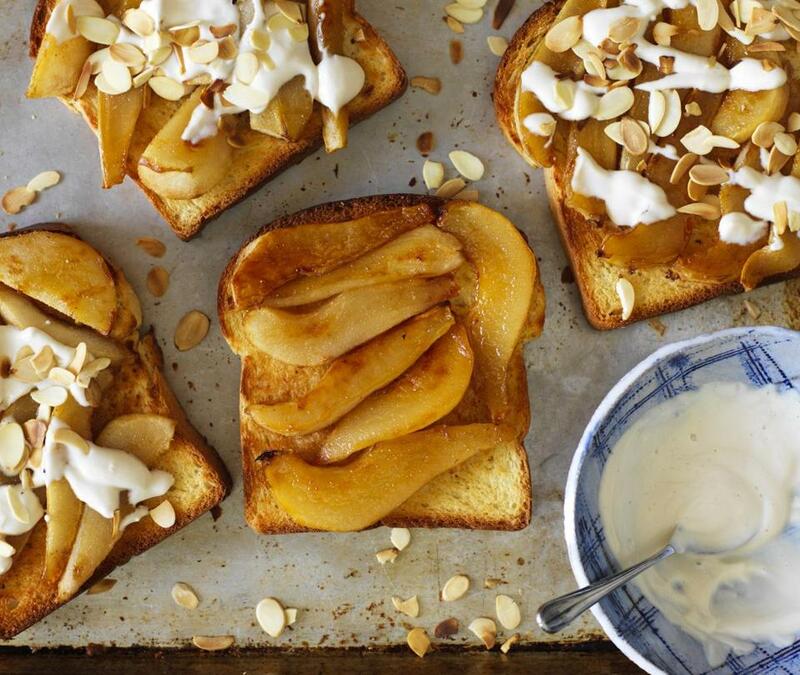 Spread the warm toasts with about 1½ teaspoons butter per slice, divide the roasted pears among the slices, top each with a portion of the yogurt mixture, sprinkle with almonds or hazelnuts, and serve at once. With the rack in the center position, heat the oven to 350 degrees. Line a rimmed baking sheet with parchment and set aside. In a medium bowl, whisk the flour, cornmeal, brown sugar, 1 tablespoon granulated sugar, ¼ teaspoon cinnamon, and ½ teaspoon salt to blend (break up any sugar lumps). Drizzle the melted butter over the mixture and, using a fork, toss to form pea- and lima bean-size clumps. Spread the clumps in a single layer on the prepared baking sheet and bake for 10 minutes. Using a thin spatula, turn over, stir, and separate the clumps, and continue baking until medium golden brown, 3 to 6 minutes longer, stirring once more during that time. Remove the baking sheet from the oven and set aside for the streusel to cool and crisp up, at least 15 minutes (you should have about 1 cup). Meanwhile, in the same bowl, toss the apples, remaining 2 tablespoons granulated sugar, remaining ½ teaspoon cinnamon, ¼ teaspoon salt, and lemon juice to combine. In a large skillet over medium-high heat, melt the remaining 1 tablespoon butter, tilting the skillet to cover the cooking surface. When the foaming subsides, add about a quarter of the apple mixture, adjust the heat to medium, and cook, stirring, until softened, about 5 minutes. Scrape the remaining apples and their juices into the skillet and cook, stirring, until the first addition of apples begins to break down and the second is softened, about 6 minutes longer. Add the cream and cook, stirring, until it thickens, about 1½ minutes longer. Scrape the mixture into a bowl and set aside to cool briefly. Taste and add salt or lemon juice if necessary. Divide the apple mixture among the warm toast slices, sprinkle each with a portion of the streusel crumbs, and serve at once. This is best served within about 15 minutes of pulling it from the oven. With the rack in the center position, heat the oven to 375 degrees. In a medium bowl, whisk 1/3 cup brown sugar and ¼ teaspoon each cinnamon and salt to blend (break up any sugar lumps). Add the cranberries and apple, and toss to combine. Pour the melted butter into a 9-by-2-inch nonstick round cake pan or baking pan and tilt it to cover the bottom. Scatter the cranberry mixture and pecans, if using, evenly over the butter and set aside. In the same bowl, whisk the yolks, cream, remaining 2 tablespoons brown sugar and remaining ¼ teaspoon cinnamon, vanilla, and ½ teaspoon salt to blend. Add the bread slices and soak until they absorb much of the liquid, about 3 minutes, flipping them halfway through. Meanwhile, in a large skillet over medium heat, melt the remaining 1 tablespoon butter, tilting the skillet to cover the cooking surface. When the foaming subsides, add the soaked bread and cook until the bottoms are toasted and golden, about 5 minutes. Arrange the bread, browned side down, over the fruit in the pan, squishing it if necessary to fit and cover all the fruit. Bake until the surface of the bread is deeply browned, about 25 minutes. Transfer to a wire rack and cool for 5 minutes. Using oven mitts, hold a plate firmly over the pan and invert the toast onto the plate. Remove the pan and replace any of the cranberry-pecan mixture stuck to the bottom of the pan. Cool for 5 to 10 minutes longer and serve, with whipped cream or ice cream if desired.